River Plate clinched their third Copa Libertadores title here Wednesday with a 3-0 victory over Tigres to shatter the Mexican side's dream of winning South America's most prestigious club tournament for the first time. Goals from Lucas Alario, Carlos Sanchez and Ramiro Funes Mori sealed a 3-0 aggregate victory for the Argentine giants after last week's first leg in Mexico had finished in a 0-0 draw. The victory completed a dramatic reversal of fortune for River, one of the iconic clubs of South American football who only four years ago suffered a humiliating relegation from the Argentinian top flight. The club's revival had been overseen by River legend, Marcelo Gallardo, a member of the team which won the Libertadores in 1996. "After 19 years we deserved this victory," Gallardo said. "The squad has sacrificed a lot. A year ago we started looking for a challenge and this was it," the River manager added. "It was not easy, we had many obstacles. God has rewarded us." Tigres had been bidding to become the first side from Mexico ever to win the Copa Libertadores. Instead they were left ruing a failure to convert their chances as River completed a victory to set alongside their wins in the tournament in 1986 and 1996. A full-blooded opening period saw some wild tackles flying in from both sides, Alario setting the tone after only nine minutes with a rugged challenge on Guido Pizarro which earned the River striker a booking. Alario's caution was one of five yellow cards shown in the opening 25 minutes, with Tigres players Israel Jimenez, Juninho, Andre-Pierre Gignac and Jose Rivas also receiving cautions. An electrifying pre-match spectacle saw the Estadio Monumental deluged with ticker-tape as clouds of smoke from a firework display billowed across the pitch. 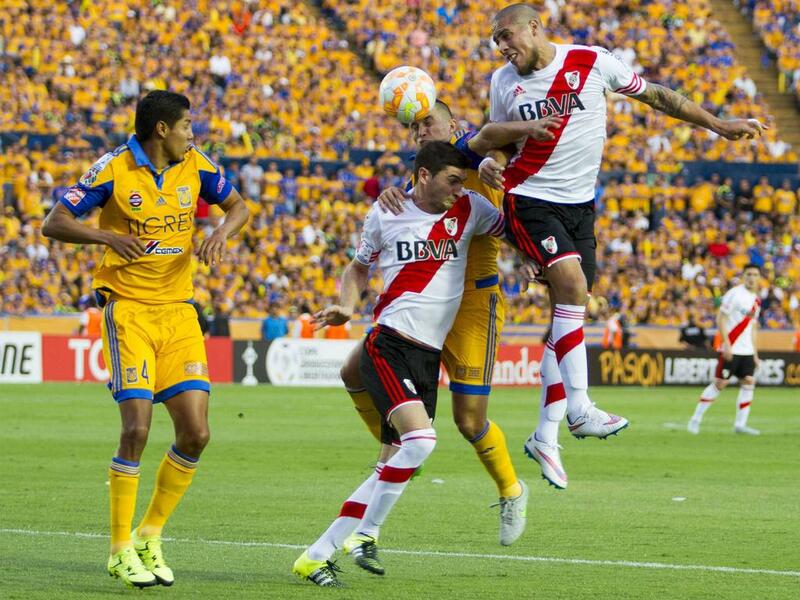 But Tigres shrugged off the intimidating atmosphere and soon began to threaten the Argentine hosts. They squandered a golden chance to take the lead after 15 minutes however, when French striker Gignac played in attacking partner Rafael Sobis for what should have been a straightforward one-on-one with River goalkeeper Marcelo Barovero. But with the goal at his mercy Sobis made a mess of his first touch, allowing River time to cover and clear to safety. Nine minutes later Tigres wasted another chance, winger Jurgen Damm cutting back for Gignac who botched his shot. Tigres were made to pay for their profligacy on the stroke of half-time. Leonel Vangioni made space for himself with a clever run and turn down the left flank, looked up and whipped in a curling cross for Alario, who stooped to glance in a fine header past Nahuel Guzman. Tigres trudged off dejectedly at half-time but threatened again in the second half and might have equalised on 68 minutes when Damm crossed for Javier Aquino only for the midfielder to head high and wide. Seven minutes later River took a stranglehold on the game when Sanchez was brought down in the box after a clumsy challenge by Aquino. Sanchez duly stepped up to convert the penalty and make it 2-0 on the night. On 79 minutes any faint hope of a miraculous Tigres fightback was snuffed out when Mori climbed high to meet Leonardo Pisculichi's cross with a downward header to make it 3-0.